Free Book Swap – A Record Breaking Community Success! Residents of Wayne County know this area is special, and the recent book swap highlighted many reasons why. 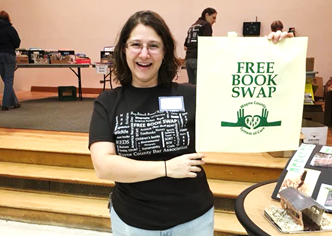 A passion for literacy, sustainability and helping others brought community organizations, local businesses and dozens of volunteers together to make the 6th annual Free Book Swap a record- breaking success! 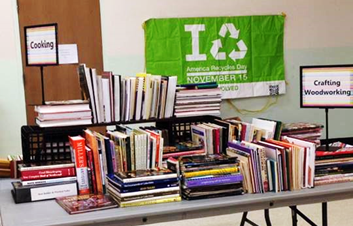 The book swap was held Sat. Nov. 18 at the Park Street Complex in Honesdale, corresponding with America Recycles Day. The former auditorium of the Stourbridge Elementary School was turned into a busy marketplace, welcoming more than 650 “swappers” from Wayne and neighboring counties and as far away as New York City. The stage area was transformed into the children’s section. Dozens of children were seen grabbing a book and reading it right there on the spot. The Wayne County Bar Association was this year’s lead event sponsor. Other repeat and new sponsors include Frey-Fetsock Funeral Home, Platform Industries, Honesdale National Bank, Wayne Memorial Hospital, and Your Way Travel. None of this was possible without their support. Another great benefit of the event, over 100 of the attendees were from outside of Wayne County and had the rest of the day to shop, play and enjoy the other businesses and attractions in Honesdale. The Rules: Bring as many as you want; take as many as you want. 16,000 (yes, sixteen thousand!) books were donated this year and volunteers sorted them all into categories, making it easy for people to make their selections. Jenna Wayne Mauder, the indefatigable coordinator of the event explains “our goal is to have at least half of the donated books taken home that day and reused and reloved, and this year, we broke all previous records! 16,000 books were donated, which is more than the total books donated from the first 3 years combined! 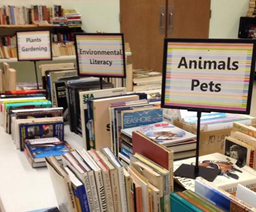 Some 679 attendees took home 9,100 books during the three day event. Jenna’s environmental education organization, NaturEd and the non-profit group SEEDS (Sustainable Energy Education and Development Support) were the hosting organizations. 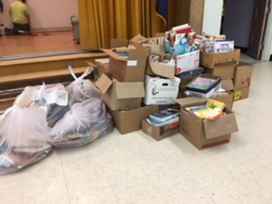 After the event, volunteers packed up 2100 pounds of quality books that remained and shipped them to Better World Books in Indiana, an organization promoting global literacy. Shipping charges are the largest expense of the annual event. The remaining books, either torn or outdated were all taken to the Wayne County recycling center. The book swap is also coordinated to provide more than just books. In addition to giving free books to anyone that wants them, the event provides an opportunity for consumers from the Human Resource Center to help set up and clean up, and work side by side with the other volunteers. Many of them took home new books to cherish. Even the WCCF Work Program Detail assisted for the clean-up and contributed to the event’s impact and success. In a digital world, the evidence of a love of books and reading was everywhere that day. 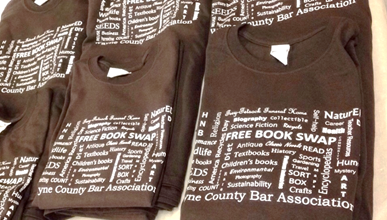 “There’s nothing quite like holding a book in your hand” said first-time Swap volunteer, Terri. “Books take me to places I may never see,” spoke one attendee.Another exclaimed “I make purses out of books!” A display table featured other fun possibilities for used books and their pages. For more about the event, visit freebookswap.wordpress.com or email Jenna at livingthenaturedlife@gmail.com. MARK YOUR CALENDAR – Next year’s event is already scheduled for November 17, so save the date, save your books, and reach out if you want to join the volunteer team. NaturED, a group of environmental educators, helps area organizations and schools with environmental programs. SEEDS (Sustainable Energy Education & Education Support) promotes energy efficiency, renewable energy and sustainable living in our region. Learn more at seedsgroup.net.